Just 100 metres from Kobuleti Beach and 2 km from the Kobuleti Nature Reserve, this hotel offers air-conditioned rooms with balconies and refrigerators. Reception is open 24 hours a day. Georgian cuisine is served in the restaurant at the Hotel Old Ural, and a hot breakfast is available each day. Guests can enjoy food and drink on the covered terrace in the summer. Rooms are bright and simply furnished, with smart wooden flooring and a TV. Every room has a private bathroom. Guests can relax in the Old Ural’s garden, or make use of the free Wi-Fi in the lobby. A 5-minute walk from Kobuleti Beach and surrounded by exotic gardens, this hotel offers traditional Georgian cuisine and a large terrace. Rooms include air conditioning, private balconies and cable TV. Individually furnished rooms with wardrobes and wooden or tiled flooring are offered at the Savane Hotel. Each room includes air conditioning, and toiletries are provided in the bathroom. European cuisine and local specialities are served in the bright restaurant with large windows. Guests can enjoy hot drinks and alcoholic beverages in Savane’s café-bar, or on the large terrace surrounded by palm trees. Savane’s 24-hour reception staff can help book excursions along the Black Sea coast. The Kobuleti Nature Reserve begins 1 km away, and the city centre is 6 km away. Between trips, guests can enjoy relaxing massages on site, while children cool off in the small outdoor pool. 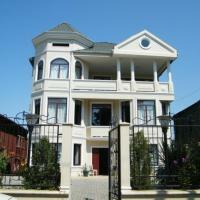 Guesthouse Belgrade is located just 100 metres from the Black Sea Coast, in the town of Kobuleti. The guest house offers a terrace and free parking. Some rooms offer free Wi-Fi. The air-conditioned rooms offer cable TV, a refrigerator, and a work desk. Toiletries are provided in the private bathrooms. A fully equipped kitchen is available, and guests can relax in front of the fireplace in the living room. A fishing boat can be hired from Guesthouse Belgrade Kobuleti, and there is a fitness centre 50 metres away. Tsitsinatela Children’s Entertainment Centre is a 5-minute drive from the guest house. Batumi Airport is 30 km away, and airport transfers can be arranged. 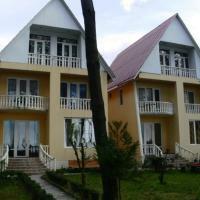 Kobuleti Hotel is located in the picturesque town of Kobuleti, just two steps from the Black Sea beach. It features a 24-hour reception, and free Wi-Fi is provided. All bright rooms come with air conditioning and a flat-screen TV. They feature a balcony with a sea view, and free toiletries are available in a bathroom. The on-site restaurant offers various Georgian dishes, and guests can have a drink at the bar. A continental breakfast is served every morning. It is possible to order different guided tours in the hotel’s tour desk or to rent a bicycle. Kobuleti Trains Station is 1 km away, and the distance to Batumi International Airport is 30 km. Located just 150 metres from the Black Sea coast, this hotel lies in the village of Kobuleti. Table tennis and barbecue facilities are featured at Hotel Shekvetili Beach. The bright, simply decorated rooms of this hotel offer wooden furnishings. The air-conditioned rooms come with satellite TV and a private bathroom. Some rooms have balconies overlooking the sea. Breakfast, lunch and dinner are served in the hotel’s dining room. Guests can relax in the shared lounge room. Kobuleti Train Station is 2 km away. Batumi Central Train Station is 25 km from Hotel Shekvetili Beach, and Batumi Airport is 30 km away. Le Chveni Ezo se trouve à 150 mètres des côtes de la mer Noire et d'une gare routière desservie par des lignes reliant le centre-ville de Kobuleti situé à 5 km. L'hôtel met à votre disposition une terrasse, une connexion Wi-Fi gratuite et une réception ouverte 24h/24. Décorées avec simplicité et dans des couleurs vives, ses chambres offrent une vue sur le jardin et sont équipées d'une télévision ainsi que d'un bureau. Le Chveni Ezo abrite un restaurant, qui dispose d'une télévision et propose des spécialités géorgiennes et européennes, ainsi qu'un bar où vous pourrez prendre un verre. L'établissement se situe à 700 mètres du parc central de Kobuleti, un lieu de détente où il est également possible de jouer au football. L'hôtel Chveni Ezo se trouve à 7 km de la gare de Kobuleti ainsi qu'à 30 km de l'aéroport de Batoumi. Il possède un parking privé gratuit et peut fournir un service de navette aéroport moyennant des frais supplémentaires. Less than a 1-minute walk from Kobuleti Beach, this hotel enjoys a central location in the seaside resort. A 24-hour reception, Georgian restaurant and free Wi-Fi in the elegant lobby are offered here. The air-conditioned rooms at King Palace feature homelike interiors with light wooden flooring and patterned fabrics. All are equipped with a refrigerator, TV and complimentary toiletries. Traditional Georgian meals are served in the hotel’s Restaurant Elit. Guests can start the day with a full breakfast, which can even be brought to your room on request. Visitors can discover the beautiful scenery of Mtirala National Park and Kintrishi Nature Reserve, both only a 30-minute drive of the hotel. A shuttle service to Kobuleti Train Station (3 km) and Batumi International Airport (40 km) is offered by King Palace.